Key developments in the week of November 11th include the layered insecurity in Mali, the unpredictability of the recent Boko Haram activity in Nigeria, the instability in CAR and the DRC, and large protests in North Africa. In Mali, a Group for Support of Islam and Muslims (JNIM) suicide bomber detonated an explosives-laden vehicle against the compound of a mine clearance operator in Gao on November 12th. The attack killed three Malian civilians and wounded 32 others, including four UNMAS contractors. JNIM and other militant groups have carried out several similar attacks in Gao in the past, the last one dating back to July 1st and the largest one to January 2017, where 54 people died. The heavily militarised nature of the town makes it a strategic target for these groups. On the same week, JNIM militants claimed responsibility for another ambush on a Malian checkpoint at the outskirts of Diabaly (Segou region). JNIM has demonstrated a high operational tempo over the past few weeks, as in addition to the above, they perpetrated two complex attacks against MINUSMA contingents in the Tombouctou and Mopti regions at the end of October. The French and Malian forces have stepped up their military operations against the militants as a result. Last week, they targeted Katiba Al Mansour and Katiba Macina militants through air and ground operations in the areas of Inadiatafane (Tombouctou) and Wagadou (Koulikoro), leaving an estimated 17 militants dead, including the leader of the Katiba Al Mansour. Lastly, violence involving Dogon, Dozo and Fulani communities last week confirmed the escalating trend in intercommunal targeting in Mali. In Nigeria, the Boko Haram threat in Borno state has grown more unpredictable since the start of October. The militants increasingly target farming and displaced communities; and limit ambushes against state forces to attacks on military bases. This trend has come in conjunction with a rise in the activity by the Islamic State (IS)-allied Boko Haram faction (Barnawi faction). Last week, Barnawi militants killed 15 farmers in two villages in Monguno while other Boko Haram members abducted ten female IDPs outside of Maiduguri, amongst others. Both factions also attacked military bases in Karetu in Mobbar LGA and in Kekeno in Kukawa. The military has carried out several airstrikes against key Boko Haram positions on the fringes of Lake Chad and near the Sambisa forest over the last weeks as a result, and launched Operation Green Sweep on November 14th to further strengthen its air response. 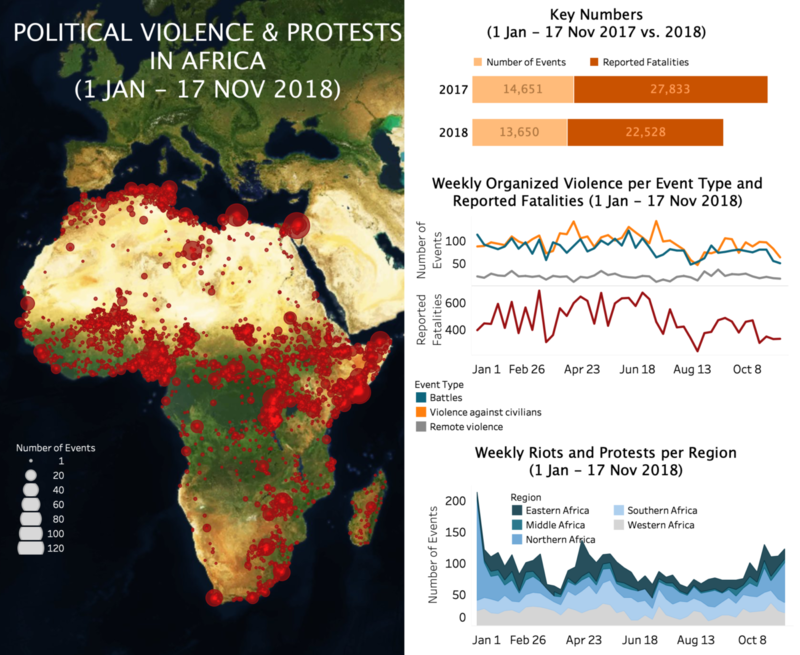 There were also high levels of violence in the Central African Republic (CAR) and in the Democratic Republic of Congo (DRC) in the week of November 11th. In CAR, the uneasy calm prevails since the withdrawal of the coalition of ex-Seleka factions from the Russia backed-Khartoum peace negotiations and the removal of Karim Meckassoua from the presidency of the National Assembly. In Bambari, fighters of the Union for Peace in the Central African Republic (UPC) held hostage six members of an Islamic committee mediating between armed groups in the town. A few days later, in Alindao, a retaliatory attack by UPC fighters to Anti-Balaka violence against Muslim civilians revealed the tense cohabitation of armed groups in the area. The UPC clashed with Anti-Balaka fighters and attacked an IDP camp hosting around 20,000 Christians, leaving a reported 48 people killed and structures pillaged and burnt down. In the DRC, the joint Congolese/MONUSCO response to the rising violence by the Allied Democratic Forces (ADF) in Beni suffered an important setback last week, with 19 soldiers and peacekeepers reportedly killed in an offensive in Beni on November 14th; other ADF attacks occurred on bases later in the week. Meanwhile, dozens of fatalities were reported from the continued fighting between Burundian forces and rebels in Sud-Kivu, and at least two students were killed in protests against a teacher’s strike in Kinshasa. Lastly, large protests dominated the political landscape in North Africa last week. In Tunisia, protests and riots by labour group (teachers, civil servants, health workers, textile workers, etc) have multiplied ahead of the general strike planned by the Tunisian General Labour Union (UGTT) starting November 22nd. Meanwhile, in Algeria, protests have primarily denounced the poor state of public infrastructure and the decisions as part of social housing programmes, while in Morocco, thousands of students have protested the government’s decision to stay on GMT+1 all year-round across the major towns over November 8-12th.